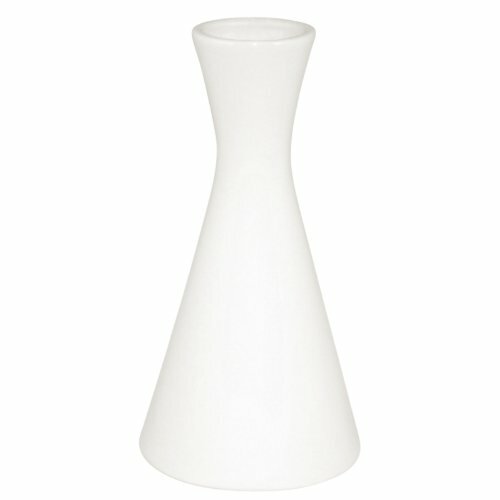 Olympia Whiteware Bud Vase 5 1/2''(h). Pack quantity: 6 by Olympia at Main Street Deli and Cafe. MPN: CB701. Hurry! Limited time offer. Offer valid only while supplies last. Great value pure white porcelain hotelware. Stackable with strengthened rolled edges for chip resistance. Fully vitrified to ensure glaze durability. Great value pure white porcelain hotelware. Stackable with strengthened rolled edges for chip resistance. Fully vitrified to ensure glaze durability. Dishwasher proof. Dimensions 10 1/4(W)" X 7 1/2(D)"